The United States is home to hundreds of cities and towns, each with its own unique history — many of which stretch back decades or even several centuries. And among the many is nearly every combination of size, geography, and lifestyle one could want, with small towns and big cities, coastal communities and mountain villages, swamp-side neighborhoods and desert oases — and just about everything in between. But despite the draw of a particular climate or style of life, some criteria we use to pick a place to call home have little to do with the town’s charm or bustle, and more to do with the opportunities for personal, financial, and career-oriented growth. That’s because no amount of history or geography can make up for a lack of jobs or a stagnant local economy when the bills come due and money gets tight. Although fewer Americans are moving for work than have in the past, the ability to find a job in a new town is often at the forefront of our minds whenever we relocate, regardless of the impetus. And, of course, that doesn’t mean finding just any job; you still need to make ends meet. This means taking into consideration both the potential salary you’ll earn, as well as the city’s cost of living. 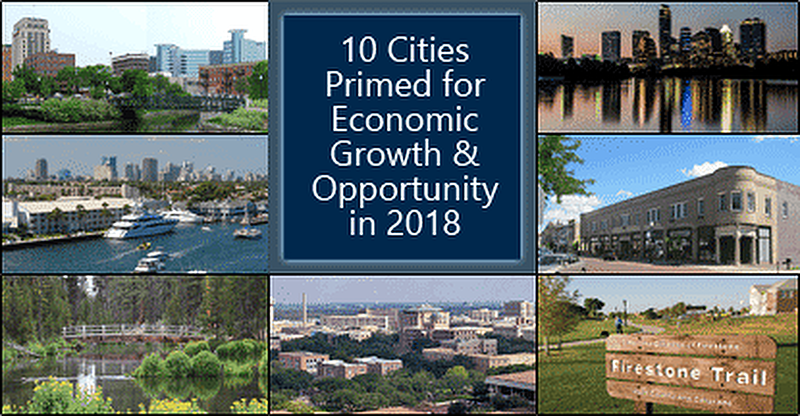 For the 10 locations on our list of 10 Cities Primed for Economic Growth & Opportunity in 2018, we considered all of these factors — and more — as we took a look at cities large and small. 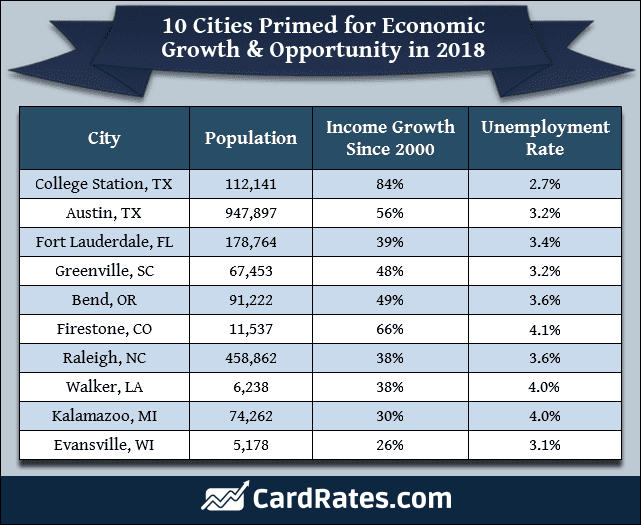 Not only do our 10 cities have unemployment rates at or below the national average of 4.1%, but each has shown promising increases in its median household income and offers a reasonable cost of living for its local region. While our list is certainly not an exhaustive directory of all the potentially up-and-coming towns, it does have a little bit of everything. We have big cities, like number two, Austin, TX, and small towns — number 10, Evansville, WI, has a population of just over 5,000 — representing a range of geographies and all four major time zones. No matter which region of the country you want to explore, you can find a town primed for growth. The first of two Texas towns on our list, College Station is located roughly equidistant from Houston and Austin. Although the city has seen a population increase of about 25% over the last 10 years, College Station, with fewer than 120,000 residents, is large enough to offer city amenities, while still being small enough to maintain that hometown feel. College Station’s unemployment rate is well below the national average at 2.7%, the lowest among the cities on our list, and the median household income has grown more than 80% since 2000. The city’s largest employer is Texas A&M University, which has its main campus in College Station, and is nationally recognized as a Land-, Sea-, and Space-Grant Institution. Less than 100 miles from our top city of College Station, is our number two pick and the state capital, Austin, TX. The fourth most populous city in the state, Austin has a population just under 950,000 after a 20% jump in the last decade as the city has grown into a hub for technology and innovation. That booming industry has also helped Austin keep a low unemployment rate and boost median income levels more than 55%. In fact, many of the companies behind Austin’s economic growth are also many of the fastest-growing and cutting-edge companies in technology today, earning the Austin area the nickname “Silicon Hills” in a nod to the West Coast’s Silicon Valley. Dozens of technology giants boast a presence in Austin, including Apple, Amazon, Cisco, Dell, PayPal, EA, Google, Intel, Nvidia, Oracle, and Samsung — just to name a few. Located approximately 30 miles from Miami, Fort Lauderdale, FL, has less than half the population and a much more affordable cost of living. While most of the state felt the full effects of the Great Recession when the Florida housing market crashed, Ft. Lauderdale is among the many cities making a solid rebound as the market recovers. The city sports a low unemployment rate of just 3.4% and shows steady increases in median household incomes. Despite its one-time reputation as a top spring break destination, today’s Ft. Lauderdale often draws a wealthier tourist crowd, with many visitors attending events at the city’s convention center or hopping on board a cruise ship — or even their own ship. The boating and marine industry is one of the city’s major employers, and Fort Lauderdale’s annual International Boat Show is the world’s largest boating convention. Over 100 miles northwest of Columbia, SC, and a stone’s throw from the North Carolina border is our number four city, Greenville, South Carolina. With a population just over 65,000, Greenville is somewhere between “big town” and “small city,” providing a low unemployment rate and an almost 50% increase in median household income over the last two decades. Once known as “The Textile Capital of the World,” Greenville’s current economy is less focused on textile manufacturing these days. Instead, the city is the North American headquarters for a number of major international companies, including Amexo, CertusBank, and tire giant, Michelin. The town is a growing center for technology and research, with the International Center for Automotive Research opening in 2003, and the Center for Emerging Technologies opening in 2011. Rounding out the top five, Bend, OR, is a medium-sized town in the middle of the state, boasting a population of just over 91,000 that’s seen nearly 20% growth in the last ten years. The city’s low unemployment rate and growing median income may make it an attractive spot for residents, but it’s the area’s geography that is at the heart of Bend’s large tourism industry, with its skiing, biking, fishing, and other outdoor activities drawing in over $500 million in annual revenue. In addition to its thriving tourism industry, Bend residents find work in its healthcare, scientific, technology, and manufacturing industries. Some of the city’s major employers include St. Charles Medical Center, Les Schwab Tire Centers, and IBEX Global. One of the smaller towns on the list, Firestone, CO, also has one of the higher unemployment rates, coming in equal to the national average. However, the city’s median household income has grown more than 65% since 2000, and while the cost of living is higher than the national average thanks to its pricey housing market, Firestone is about on par with Colorado as a whole — and significantly more affordable than nearby Boulder. Thanks to its scenic (and convenient) location, a large portion of Firestone’s economy is based on the tourist trade, with retailers, transportation, and accommodations all playing significant roles in the job market. The city’s manufacturing industry also employs a good portion of the population, with the professional, scientific, and technical services also a major source of jobs. The capital of North Carolina, Raleigh is the state’s second-largest city (behind Charlotte), with a population of approximately 458,000. Few of those nearly half a million residents are without work, however, as the city’s unemployment rate is well below the national average at just 3.6%. And while median household income growth isn’t as robust as in some of our other cities, Raleigh’s growing technology sector means that’s likely to change for the better. One of the tiniest towns on the list with a population a little over 6,000 people, Walker, LA, is only about 20 miles east of Baton Rouge. Walker’s unemployment rate is well below that of both its big-city neighbor and the national average, coming in at 3.3%. The cost of living in Walker is also below the national average, making it one of the most affordable cities on our list. The majority of Walker’s residents work in the construction and healthcare industries, with roughly half the population employed in one of these areas. The city’s retail, manufacturing, and education sectors also provide a significant number of jobs to Walker residents. About halfway between Chicago and Detroit, Kalamazoo, MI, is a midsize city with a population around 75,000. While its unemployment rate is just under the national average and its median income growth less than some of our other picks, Kalamazoo’s low cost of living is the most affordable on our list and helps make up the difference. In addition to being home to Western Michigan University, Kalamazoo plays host to the W. E. Upjohn Institute for Employment Research, the Fetzer Institute, and the economic development organization, Southwest Michigan First. The city is also a growing haven for craft beer entrepreneurs — and craft beer connoisseurs — sporting dozens of breweries and brewpubs throughout the city, including Bell’s Brewery and Rupert’s Brewhouse. The final city on our list, Evansville, WI, is also the smallest, with a population just over 5,000, but it has a lot of history, having been first settled in the 1830s. Though Evansville has shown the least median income growth of our cities, its low unemployment rate and competitive cost of living both add to Evansville’s appeal, particularly for those who prefer the small-town life over the big-city bustle. Manufacturing provides a number of jobs to Evansville citizens. Major employers include the Baker Manufacturing Company, which makes pumps and wells, Stoughton Trailers, a producer of semi-trailer chassis, and Varco-Pruden, which manufactures prefabricated metal buildings. Covering roughly 3.8 million square miles, the US is home to cities and towns of every shape and size, covering multiple time zones and every major biome. And while every one of those communities may not be thriving, many are healthy and growing, primed for bright futures full of economic growth and opportunity — much like the 10 cities on our list, which all show strong promise today and for tomorrow.